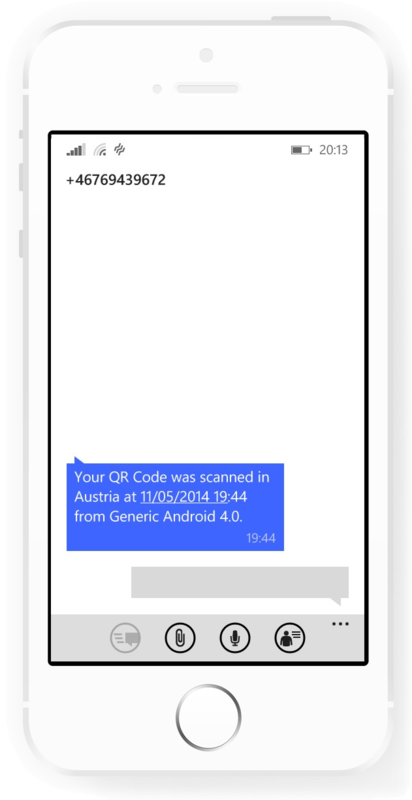 If someone scans your QR code and you have the SMS notification feature enabled, an SMS with the scanning date, location and phone model is delivered immediately to your registered phone number. You can create custom SMS templates (up to 160 characters), as shown in the figure on the right. If the number is not correctly formatted the gateway refuses to send an SMS. With the integrated SMS Gateway (10 U$ / month) SMS are delivered within a few seconds. Please Contact Us to enable your SMS gateway. You can purchase SMS bundles of 500 pieces. Sending an SMS costs - cents per SMS in .